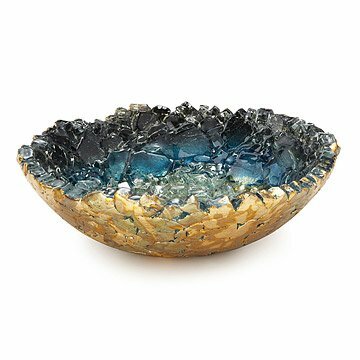 This exquisite bowl of reclaimed glass and copper is the product of a painstaking process. This richly textured vessel is a treasure of kiln-formed glass adorned with lustrous copper. Each piece is the product of a two week, multi-step process in which artist Mira Woodworth collects upcycled glass fragments and uses the annealing process to apply a vibrant layer of copper leaf to the exterior. Because she uses reclaimed glass, the surface of each piece will vary through dramatic undulations and small voids that celebrate the rich interplay of materials. These dynamically decorative bowls make dramatic centerpieces and decor focal points with an in-depth origin story. Handmade in Sacramento, California. Mira Woodworth is an award-winning glass artist who focuses on reclaimed glass and casting. Mira is a Niche Award Finalist and her work has been published in “Sculpture and Design in Recycled Glass,” by Cindy Ann Colidron. While her focus remains on glass art, she also works with recycled materials, painting, and metal forming. The vessel is intended for decorative purposes only. It is not intended for food. It is not dishwasher safe. To clean, dust with a moist cloth. Avoid allowing water or any other liquid to seep into the texture of the bowl as it may dislodge metal leafing if allowed to soak. This is a made-to-order item. If you order today your item will ship no later than 5/10/2019. I wish that I had bought it sooner.